When it comes to wedding design, I have to admit that I really admire stylists and event designers who don't shy away from color! 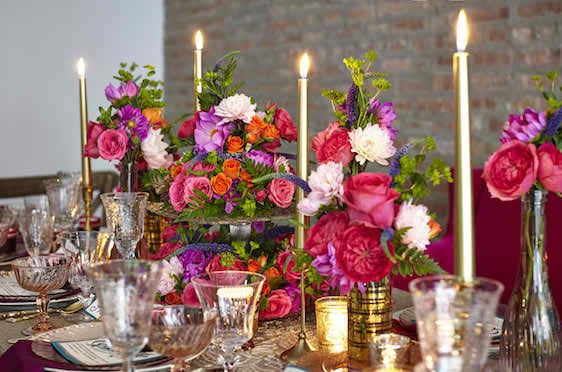 Fearless floral designers who love to incorporate bright blooms? Designers who aren't afraid to make a statement? Yep, those are the kind of event pros that I absolutely adore. Do you love colorful event design too? Colorful tablescapes that pop? Designers who think outside of the box while still incorporating personal touches throughout? Well, get excited, my loves! Because today I have something totally new and fresh to share with you. It's a fabulous new series called 'Stylist Spotlight,' and I'm just so excited to get started! In this new series, I'm going to be featuring some of my all time favorite floral and event designers in the industry. So let's kick this series off right! Shall we? Starting off with the oh-so talented Christine Janda of Christine Janda Design and Events, Christine's eye for design and details is absolutely inspiring as evidenced in her Jewel Tones Meets Modern Vintage Design below, photographed by Neil Burger Photography! Based in Chicago, what I love most about Christine Janda's design approach is the fact that she thinks colorfully and creatively while still placing emphasis on incorporating thoughtful and heartfelt details throughout. From the designer, "With this inspirational shoot I wanted to showcase my favorite wedding trend right now: couples diving head first into color!" 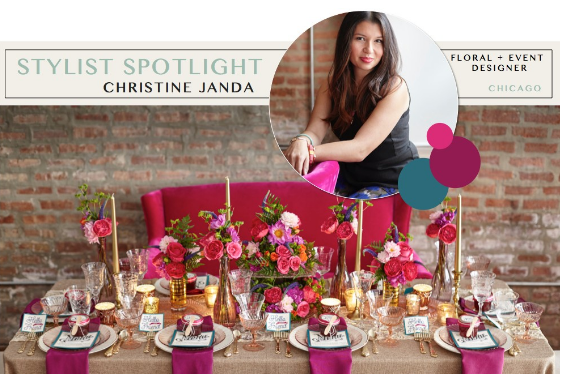 No Comment to " Stylist Spotlight: Christine Janda | Chicago Event Designer "